The Gossamer Albatross was designed and built by a team led by Paul B. MacCready, a noted aeronautics engineer, designer, and soaring champion. The Gossamer Albatross was his second human-powered aircraft. The Gossamer Condor, won the first Kremer prize on August 23, 1977 by completing a mile-long figure-eight course. The second Kremer challenge was then announced as a flight across the English Channel. 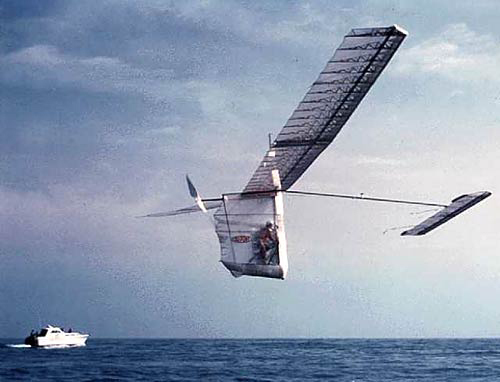 The Gossamer Albatross was constructed using a carbon fiber frame, with the ribs of the wings made with expanded polystyrene. The entire structure was then wrapped in a thin, transparent plastic. The empty weight of the airplane was only 71 pounds. To maintain the craft in the air it was designed with very long tapering, like those of a glider, allowing the flight to be undertaken with a minimum of power. On June 12, 1979, piloted by amateur cyclist Bryan Allen, it completed the 22.2 mile crossing in 2 hours and 49 minutes, achieving a top speed of 18 mph and an average altitude of 5 feet. And a big thank you to everyone for supporting us by checking in to the Net.